Removal of toxic heavy metals from wastewater is an important environmental challenge. In this Study, Zn (II) removal from aqueous solution by chitin extraction from crustaceous shells (shrimp and crab) was investigated. The biosorption studies were determined as a function of contact time, pH, initial metal concentration, and the amount of adsorbent. Adsorption of Zn (II) increased with decreasing concentration of the adsorbents and reached maximum uptake at 0.5 g. Effect of pH was studied in the range of 3-7 and the optimum conditions for both adsorbents were found in the range of 5-7. Zn (II) adsorption for both adsorbent was evaluated by Langmuir and Freundlich Isotherms. Results indicated that the Freundlich isotherm model was the most suitable one for the adsorption process using chitin extracted of shrimp and crab shells. The pseudo-first order and pseudo second order kinetic models were used to describe the kinetic data. The adsorption capacity (qmax) calculated from Langmuir isotherm and the values of the correlation coefficient obtained showed that chitin extracted from shrimp shells has the largest capacity and affinity for the removal of Zn (II) compared with the chitin extraction from the crab shells. Veli S, Alyuz B. Adsorption of copper and zinc from aqueous solutions by using natural clay. J Hazard Mater 2007; 149(1): 226-33. King P, Anuradha K, Lahari SB, Prasanna KY, Prasad VS. Biosorption of zinc from aqueous solution using Azadirachta indica bark: equilibrium and kinetic studies. J Hazard Mater 2008; 152(1): 324-9. Fu F, Wang Q. Removal of heavy metal ions from wastewaters: a review. J Environ Manage 2011; 92(3): 407-18. Li H, Bi S, Liu L, Dong W, Wang X. Separation and accumulation of Cu(II), Zn(II) and Cr(VI) from aqueous solution by magnetic chitosan modified with diethylenetriamine. Desalination 2011; 278(1-3): 397-404. Aydin YA, Aksoy ND. Adsorption of chromium on chitosan: Optimization, kinetics and thermodynamics. Chemical Engineering Journal 2009; 151(1-3): 188-94. Apiratikul R, Pavasant P. Batch and column studies of biosorption of heavy metals by Caulerpa lentillifera. Bioresour Technol 2008; 99(8): 2766-77. Sari A, Tuzen M, Soylak M. Adsorption of Pb(II) and Cr(III) from aqueous solution on Celtek clay. J Hazard Mater 2007; 144(1-2): 41-6. Pinto PX, Al-Abed SR, Reisman DJ. Biosorption of heavy metals from mining influenced water onto chitin products. 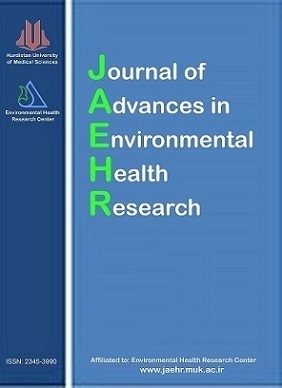 Chemical Engineering Journal 2011; 166(3): 1002-9. Brugnerotto J, Lizardi J, Goycoolea FM, Arguelles-Monal W, Desbrieres J, Rinaudo M. An infrared investigation in relation with chitin and chitosan characterization. Polymer 2001; 42(8): 3569-80. Ahmad AL, Sumathi S, Hameed BH. Coagulation of residue oil and suspended solid in palm oil mill effluent by chitosan, alum and PAC. Chemical Engineering Journal 2006; 118(1-2): 99-105. Benguella B, Benaissa H. Cadmium removal from aqueous solutions by chitin: kinetic and equilibrium studies. Water Res 2002; 36(10): 2463-74. Zhou D, Zhang L, Zhou J, Guo S. Cellulose/chitin bead for adsorption of heavy metals in aqueous solution. Water research 2004; 38(11): 2643 50. Hawke D J, Sotolongo S, Millero F J. Uptake of Fe(II) and Mn(II) on chitin as a model organic phase. Marine chemistry 1991; 33(3): 201-212. Du Y, Zhao Y, Dai S, Yang B. Preparation of water-soluble chitosan from shrimp shell and its antibacterial activity. Innovative Food Science & Emerging Technologies 2009; 10(1): 103-7. Yen MT, Yang JH, Mau JL. Physicochemical characterization of chitin and chitosan from crab shells. Carbohydrate Polymers 2009; 75(1): 15-21. Kucukgulmez A, Celik M, Yanar Y, Sen D, Polat H, Kadak AE. Physicochemical characterization of chitosan extracted from Metapenaeus stebbingi shells. Food Chemistry 2011; 126(3): 1144-8. Kim SK. Chitin, Chitosan, Oligosaccharides and Their Derivatives: Biological Activities and Applications. New York, NY: Taylor & Francis Group; 2010. Benavente M, Moreno L, Martinez J. Sorption of heavy metals from gold mining wastewater using chitosan. Journal of the Taiwan Institute of Chemical Engineers 2011; 42(6): 976-88. Sagheer FAA, Al-Sughayer MA, Muslim S, Elsabee MZ. Extraction and characterization of chitin and chitosan from marine sources in Arabian Gulf. Carbohydrate Polymers 2009; 77(2): 410-9. Wang Y, Chang Y, Yu L, Zhang C, Xu X, Xue Y, et al. Crystalline structure and thermal property characterization of chitin from Antarctic krill (Euphausia superba). Carbohydr Polym 2013; 92(1): 90-7. Susana Cortizo M, Berghoff CF, Alessandrini JL. Characterization of chitin from Illex argentinus squid pen. Carbohydrate Polymers 2008; 74(1): 10-5. Majtan J, Bilikova K, Markovic O, Grof J, Kogan G, Simuth J. Isolation and characterization of chitin from bumblebee (Bombus terrestris). Int J Biol Macromol 2007; 40(3): 237-41. Cardenas G, Cabrera G, Taboada E, Miranda SP. Chitin characterization by SEM, FTIR, XRD, and 13C cross polarization/mass angle spinning NMR. Journal of Applied Polymer Science 2004; 93(4): 1876-85. Abdulkarim A, Isa MT, Abdulsalam S, Muhammad AJ, Ameh AO. Extraction and Characterisation of Chitin and Chitosan from Mussel Shell. Civil & Environmental Research 2013; 3(2): 108-14. Karthikeyan G, Anbalagan K, Andal NM. Adsorption dynamics and equilibrium studies of Zn (II) onto chitosan. J Chem Sci 2004; 116(2): 119-27. Vijayaraghavan K, Winnie HYN, Balasubramanian R. Biosorption characteristics of crab shell particles for the removal of manganese(II) and zinc(II) from aqueous solutions. Desalination 2011; 266(1-3): 195-200. Lee JW, Ashby RD, Day DF. Role of acetylation on metal induced precipitation of alginates. Carbohydrate Polymers 1996; 29(4): 337-45. Gon?alves JO, Duarte DA, Dotto GL, Luiz AA. Use of Chitosan with Different Deacetylation Degrees for the Adsorption of Food Dyes in a Binary System. CLEAN - Soil, Air, Water 2014; 42(6): 767-74. Kurita K. Controlled functionalization of the polysaccharide chitin. Progress in Polymer Science 2001; 26(9): 1921-71. Wuertz S, Muller E, Spaeth R, Pfleiderer P, Flemming HC. Detection of heavy metals in bacterial biofilms and microbial flocs with the fluorescent complexing agent Newport Green. J Ind Microbiol Biotech 2000; 24(2): 116-23. Ho YS, Huang CT, Huang HW. Equilibrium sorption isotherm for metal ions on tree fern. Process Biochemistry 2002; 37(12): 1421-30. Bhattacharya AK, Mandal SN, Das SK. Adsorption of Zn(II) from aqueous solution by using different adsorbents. Chemical Engineering Journal 2006; 123(1-2): 43-51. Arshad M, Zafar MN, Younis S, Nadeem R. The use of Neem biomass for the biosorption of zinc from aqueous solutions. J Hazard Mater 2008; 157(2-3): 534-40. Kalyani G, Babu Rao G, Saradhi V, Kumar YP. Equilibrium and kinetic studies on biosorption of zinc onto Gallus Domesticus shell powder. ARPN Journal of Engineering and Applied Sciences 2006; 4(1): 39-49. Souag R, Touaibia D, Benayada B, Boucenna A. Adsorption of Heavy Metals (Cd, Zn and Pb) from Water Using Keratin Powder from Algerien Sheep Hoofs. European Journal of Scientific Research 2009; 35(3): 416-25. Israel U, Eduok UM. Biosorption of zinc from aqueous solution using coconut (Cocos nucifera L) coir dust. Archives of Applied Science Research 2012; 4(2): 809-19. Lu S, Gibb SW, Cochrane E. Effective removal of zinc ions from aqueous solutions using crab carapace biosorbent. Journal of Hazardous Materials 2007; 149(1): 208-17.